Efficiency means savings, and our technology is the most efficient. 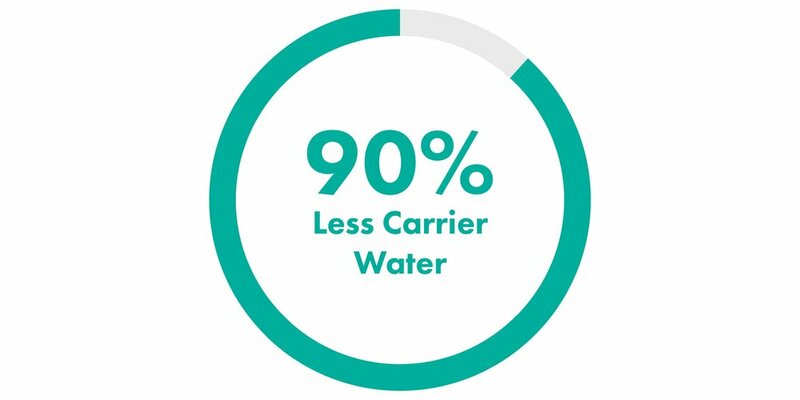 In a head-to-head comparison, BIG used nearly 25% less carbon dioxide and 90% less water than the competing pressure solution feed system, resulting in an operational cost savings of over 40%. With BIG, less is more. Our technology uses 40% less carbon dioxide than direct injection or conventional bubble diffusion systems. It can also reduce or eliminate the need for concrete basins. BIG doesn’t just protect your water. We protect you too. Rather than handling and storing strong acids onsite like conventional alternatives, we use carbon dioxide - the safest pH adjustment method on the market. No matter where your water is, we can treat it. BIG can deliver dissolved carbon dioxide wherever your system calls for it: pipes, tanks, basins, channels. You name it. Each unit’s fully automated control provides rapid, reliable results - minimizing basin requirements, reducing the downstream pipe length and lowering capital costs in the process. With BIG, you’re in good company. We directly partner with multiple carbon dioxide gas storage and feed providers to offer a fluid, streamlined purchasing process. In the process of planning a plant expansion project, facility managers at Missouri American Water partnered with design consultants at Black & Veatch to select and install BlueInGreen's carbon dioxide dissolution system, the CDOX®, capable of treating the plant’s current flow rate of 3.1 million gallons per day, while also preparing the facility for its future flow rate of 5 million gallons per day. The CDOX® is expected to reduce water usage, power consumption and chemical costs both now and in the future. With the help of BlueInGreen’s CDOX® technology, the Bismarck Water Treatment Plant has been able to automatically lower and maintain pH with unprecedented precision. However, the twin CDOX® units protect more than just the city’s hard water supply. By eliminating the handling and storage of strong acids onsite like conventional alternatives, the CDOX® is the safest, most cost-effective pH adjustment on the market, allowing the facility to simultaneously ensure water quality and protect employees while saving money in the process. Plant officials in Fridley, Minnesota chose to replace the 120-MGD facility's existing diffused carbon dioxide (CO2) system with BlueInGreen's CDOX® solution. Upon installation, the facility saw a 40 percent reduction in CO2 usage, leading to an annual operation cost savings of $49,000 under current conditions. In the near future, when the plant starts targeting a lower pH in the recarbonation basins, the savings are estimated to be $124,000 annually. After completing a major plant improvements project, facility managers at Omaha's Metropolitan Utilities District (MUD) were unsatisfied with their recarbonation system. Despite the large capital costs invested in the competitor's technology, the plant opted to pilot BlueInGreen’s CDOX® solution, which reduced the required carrier stream from 2,020 to 210 gallons per minute at average conditions and also lowered carbon dioxide usage from 595 to 450 pounds per hour, all while effectively stabilizing pH levels within the required three-minute span. The CDOX® is projected to save the facility $91,000 annually.